Roopkund Lake is situated at an elevation of 5,029 mts above sea level in the base of Trishul peak and Nanda Ghunti. Roopkund is also known as ‘Mystery Lake’ since human skeletons and remains of horses from the Paleolithic age was found here. The lake is nestled amidst panoramic mountain scenery, surrounded by rock-strewn glacier. Roopkund remains frozen for almost all the time of the year. The skeletal remains around Roopkund are believed to be 500-600 years old. You will be received at Kathgodam Railway Station or the Bus Stand. All trains arrive here from Delhi and various places. Kathgodam is the main Railway Station in the region. From Kathgodam, we begin our journey towards our base for the trek, Lohajung. The drive goes through the popular hill stations of Bhimtal and Almora. Bhimtal is a sister town of Nainital and Almora is a beautiful and historic town of the Kumaon region which was founded way back in 1568. You drive along amny small streams, most prominent being the River Kosi and enter into the Pindar valley. Your overnight stay at Lohanjung will be at the guest house or a permanent camp. Today we start our trek, by walking up to the village Didna. Didna is the first camp on the Roopkund Trek. The view from Didna is simply spectacular. The trail to the Didna starts with a steady climb up the Lohajung pass, then there is a descending trail till Bedni River. The Bedni River is also known as Bedni Ganga, as it is locally considered sacred. After crossing a bridge, there is a gradual climb through a forest of Oak and Bamboo. It is a good day, to click some nice photographs but important not to use up your batteries and save them for later. Our campsite is on a beautiful meadow, after crossing the village. Overnight stay in Tents or Homestays. Today’s part of the trail has steep ascents. After the climb, the views of the Garhwal Himalayas are simply majestic and stunning. You again pass through a forest of Bamboo and Oak. We eventually reach Ali Bugyal, which is a beautiful grazing meadow. Ali Bugyal is beautiful and lies on top a hill and from here we can have a 360 degrees view of the snow mountains. You can see peaks like Chaukhamba and Neelkanth. This is probably one of the most spectacular camping sites in the Garhwal Himalayas. We have our packed lunch at Ali Bugyal. We further trek to Bedini Bugyal which is around an hour almost flat walk and slight descend through meadows. Overnight stay in tents. Today we start our climb in the morning after breakfast. We first reach a place called Ghora Lotani that is around 2-2.5 hours from Bedini. Beautiful meadows follow us to Ghora Lotani from Bedini and in summers this is he last point from where horses return and hence the name. We go slight down for 30 minutes to reach Patharnachani. From here we enter into higher Himalayas with grassland disappearing along the route and rocky path welcoming us. We climb further for about 2 hours to reach Kelwa Vinayak. Kelua Vinayak or Kalu Vinayak as popularly called is a Hindu shrine and the highest point for today. We have our packed lunch here and walk down for 45 minutes to reach Bhagwabasa base for Roopkund Lake. We camp overnight at Bhagwabasa. Today is the day! Today is when we will be reaching the Roopkund Lake. Roopkund, the mystery or skeletal lake. It is advisable to start the day as early as 4 am. During early hours snow is tough due to lower temperatures and it’s easy to negotiate without getting your shoes drenched in water. 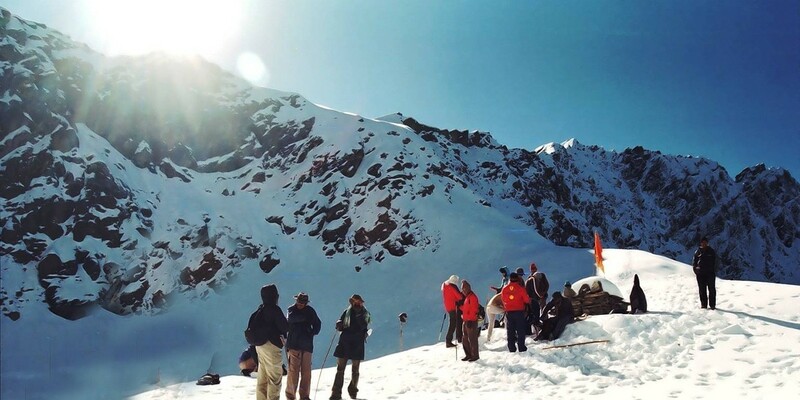 Roopkund Lake is a 3 km moderate up-hill climb from Bhagwabasa. We will have steep climb towards the end of the trail to reach the Roopkund Lake. It would take about 3 – 3½ hours to reach the lake. 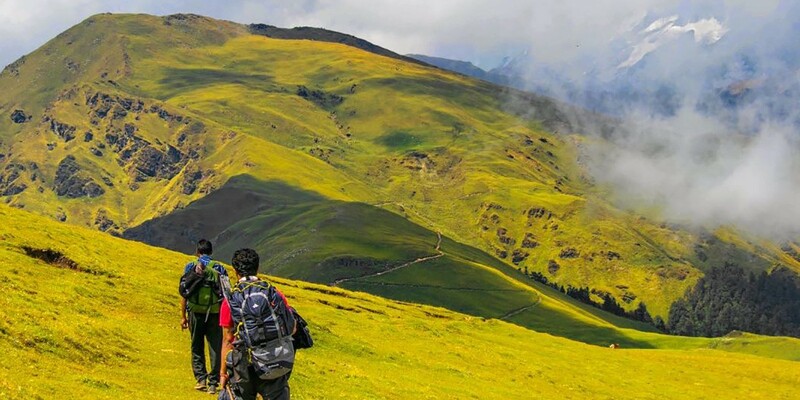 A further climb of around 20 minutes takes you to the highest point of Roopkund Lake Trek, i.e. Junargali. Then we head back for our campsite at Patharnachauni. The views from the alpine camp at Patharnachauni extends west across the main Himalayan range as far as Gangotri. You would see the end of meadows after crossing Bedini Bugyals. On a clear day, you would be astonished by looking at Mt. Trishul on your way back from Bedni Bugyal to Wan at Kanakdhar. There is a steep descend and then a short climb from Bedni Bugyal. On our way we will go through a beautiful Rhododendron forest. You would have a steep descent for the Neel Ganga stream. On reaching Wan village, we drive to Lohajung. This completes our memorable and splendid time during the trek. Time to celebrate! Overnight stay at Lohajung. Last day of our journey. Today early morning we depart from Lohajung and reach back to our end point of the trip at Kathgodam by 5 pm in the evening. PLEASE NOTE THAT DO NOT MAKE FURTHER RESERVATIONS TO DELHI / OTHER PLACES BEFORE 8 PM AS IT IS IMPORTANT TO KEEP SOME BUFFER IN MOUNTAINS. The Mighty Himalayas will miss you all and this marks the end of your Crazy Trek to Roopkund Lake! Arrive Delhi in the morning and travel further to your home. Note: It is very important that you line the inside of your bags with a big polythene sheet. Doing so will ensure, that in the event of rain, even though your bag may get wet, your clothes will still remain dry! All Meals (Veg.) starting from Dinner at lohajung on day 1 till Dinner on day 6. Smoking cigarette, chewing tobacco or related products and consuming alcohol is strictly prohibited on the trek.Anyone found in possession of the same or consuming it will be expelled from the trek. No refund will be provided.